Home / tollywoodnews / ALLU ARJUN "NA PERU SURYA" AUDIO RELEASE ON APRIL 22ND IN MILITRI MADHAVARAM. 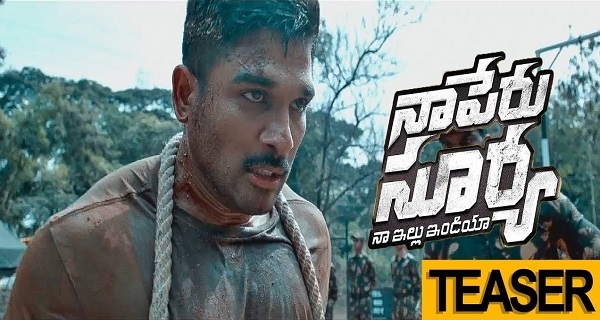 ALLU ARJUN "NA PERU SURYA" AUDIO RELEASE ON APRIL 22ND IN MILITRI MADHAVARAM. Stylish star Allu Arjun, anu Emmanuel as heroine directed by Vakkanta Vamsi "NA PERU SURYA" - NA ILLU INDIA". K.Naga babu productions. In the Ramlakshmi Cine Creations banner shirisha sridhar is the producer. Action King Arjun and Sarath Kumar are playing important roles in the film. The audio is going to be done on April 22 in Militri Madhavaram. The film is being released worldwide on May 4. The film makers say that ... Militry Madhavaram ... this is the name of unnamed patriots. From this town threshold taking care of the borders of India ... We are continuing to work for Yoga. Village Madhavaram from Tadepalligudem mandalam, West Godavari district. Many people from this village are in the Army during the British rule. Participating in World War II. Some of them were martyred. At least one person from every family in this village is in the army. That's why Militry Madhavaram is the name of Shaktanana Madhavan. "Na peru surya- na illu india". Powerful Action Emotional film. For every moment of our lives ... every moment for our defense ... We decided to make Na peru Surya's audio function in Militry Madhavaram to live with the family who sacrified a war hero from every house. We are making arrangements for the audio function on the 22nd of this month. To remind the soldiers' sacrifices once again ... to respect them ... this event is going to be grand. Allu Arjun along with the film unit is going to take part in this movie function. As soon as we learned about this town, our unit went there and met people there. We heard the great thing through our unit. We are in the background of the country's devotion, so we thought we should come back here once. When our hero Allu Arjun says, I am very happy to be here. There will meet some family. We decided to do audio in their presence. "He said.